Kym Barrett is exhibiting her latest mixed media works in an exhibition, FLOW and EBB at Regional Arts House, 24 Macquarie Street, Teneriffe, Queensland running from 9 July until 23 September. Opening night is 9 July, with an artist talk on 11 July at 10.30am, and a demonstration of practice on 25 July from 11am - 2pm, all at Regional Arts House. At a surface level, FLOW and EBB alludes to the constant rhythm of tidal water, a back and forth movement. The abstract imagery evokes passages of water and patterns of landscape. At a deeper level, FLOW and EBB is a metaphor for the fluctuating art-making process - the act of mark-making, adding and removing paint and other media over many layers, echoing the way the landscape has developed over time…a building up and a breaking down. And in latest news, Kym's oil and cold wax piece, DWELLING DEEPLY, has been selected as a finalist in the Sunshine Coast Art Prize. A PLACE TO GAZE was selected as a finalist in the Moreton Bay Region Art Awards. 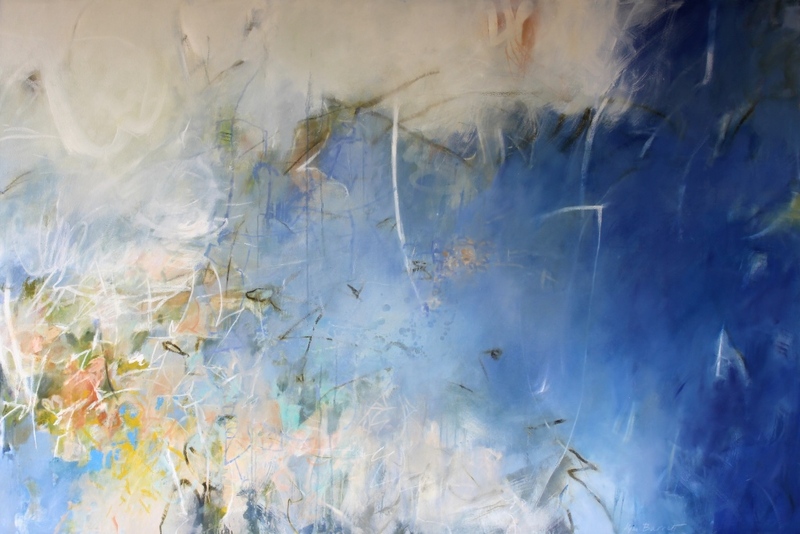 CLOUD OF UNKNOWING was deemed the best painting at the recent Immanuel Arts Festival. You can see Kym's MEMOIRS OF A LOST LANDSCAPE, as part of the touring JADA (Jacaranda Acquisitive Drawing Award) exhibition, at Sunshine Coast University Art Gallery, until 4 July. And you can now view a new short video of Kym in her studio, created by University of Sunshine Coast Creative Industries students, and now on ABC Open .